I have a new respect for oils. They absorb directly into skin and serve many purposes. 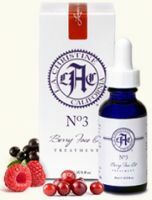 I spent the last few weeks moisturizing with LA Christine's "N°3 Berry Face Oil Treatment," using just a few drops at night and in the morning under makeup. The medicine-dropper applicator makes it easy to dispense just the amount you want (a little goes a long way here). The deep cobalt-tinted glass bottle...read more preserves the vitality of the ingredients so that the sun and/or light does not compromise their effectiveness. This is a delightful concoction of Ligonberry, Brazilian Acai Berry, and Raspberry, with all of the natural beneficial antioxidants these oils possess. It is meant for all skin types--not just dry--and the oil is not heavy at all, just a crystal-light liquid which sinks into your face and neck and works hard to moisturize, nourish, and provide anti-inflammatory properties. I've noticed that my makeup seems to glide on, and there is a new radiance besides the velvet-like, more taut feel. My ah-a moment with this came when I was rinsing it off with a rich cleanser. I kept rinsing and couldn't tell where the silky cleanser ended and my even silkier skin began! This is also wonderful for massaging into hands, elbows, cuticles, and even dry ends of hair or fly-away's. It keeps them under control with no greasy feel at all. Well done; with this product, I'll stay forever young!